Last week I discovered some CA grown Bergamot oranges at Berkeley Bowl. They're in the sour orange category and apparently tend to pop up in late winter. I had never tried them before, or even seen them in a store, and because I'm obsessed with citrus they had to come home with me. If you're a fan of Earl Grey tea, then you'll probably love the flavor profile. The oils and/or citrus peel from the Bergamot orange are used to give the tea its distinct characteristics. As for using it in a cocktail...the upshot, an obscenely complex drink that's bright and balanced, the perfect aperitif. 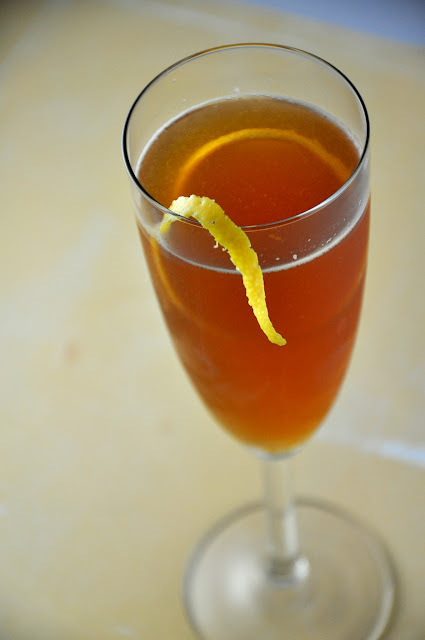 The combination of the bourbon and Bergamot makes you think black tea is actually somewhere in the cocktail. Shake the bourbon, sweet vermouth, and orange juice for about 15 seconds with ice. Double strain through a sieve or wire strainer and into chilled champagne flute. This is to remove any citrus pulp from the drink. Top off with prosecco, and add a healthy orange twist to the drink. The oils from the peel work nicely in place of orange bitters. Use a vegetable peeler for a thicker twist. *Cocchi di Torino is an amazing Italian sweet vermouth. If you like Carpano Antica, you will want to pick up a bottle of this. Try Cask or K and L.